I had this yarn I had recycled by unraveling a large scarf I bought at the Goodwill outlet store ($1.29/pound! ), and it was variegated pastels. 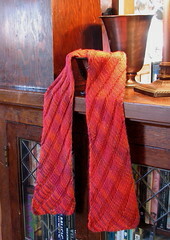 It made me think that a Clapotis would be fun to knit with it. But I didn’t have enough for the full-size item, so I knit a mini-Clapotis. When the scarf was almost done, I realized the pastel Easter egg colors weren’t really anything I wanted to wear. It just looked too “baby girl.” So I gambled. I overdyed the whole darned scarf in Kool-Aid — “jamaica” (hibiscus) flavor. And this was the result — a deep red/pink/orange/brown. I am very pleased. This is really the first knitted item I’ve completed that I have been fully happy with. The others, while I like them, have mistakes that irritate me. This one isn’t perfect, but it really looks much better than what I’ve done before, and so I think I am improving. I might be getting faster, too — it took only a week! And, hey, it’s knitted in the bias! Cool, huh? More photos of the project, from beginning to end, are on my Flickr site. “I Got You” — Split Enz: One of the greatest pop hooks ever. The verse was weak; Neil Finn’s songwriting still had some improvement ahead. But it didn’t matter — that chorus! “Daily Mutilation” — The Posies: Why are there always Posies songs in my Random Ten? Well, I have more than 300 Posies tracks on my computer. That would do it. “Give Up The Funk (Tear The Roof Off the Sucker) — Parliament: Apparently Party Shuffle really wants to party today. “Lost in Space” — Glenn Tilbrook: Ex-Squeeze guy, now doing great solo stuff. “Precious” — Pretenders: This is probably one reason why I wore Chrissie Hynde’s haircut for most of the 1980s. “Tall Cool One” — The Wailers: Not the reggae Wailers, but the Pacific Northwest band from the early 1960s. One of the all-time great instrumentals. “Brighter Than Sunshine” — Aqualung: I generally avoid bands named after anything related to Jethro Tull. But hey! I like this. Hmm. Not that autumnal, really. I finished my first pair of knitted socks! They are not exactly alike; the second sock is slightly smaller (because of some mistakes I made on the first that I didn’t make on the second). But it doesn’t show when I am wearing them. It’s all a learning process, you see. Anyway, another finished project! And now on to something entirely un-socklike. Oh, I just noticed the post from last month showing my early sock progress. I think I had been messing with it off and on for a week (only 2-4 rows a day for the first few days, then I started getting into it) when I took that photo, so in that case, it took me just over a month to knit a pair of socks. For a slow newbie knitter like me (who didn’t even knit every day) that’s pretty good. But of course it’s terribly slow compared to what other knitters can do. Hmm, nothing particularly new this time. And several songs that are revivals of old song styles (Joe Jackson, Stray Cats, Squirrel Nut Zippers). Odd how songs will bunch up like that. How many times do we have to vote YES? That’s right, another monorail election. This would be the fifth time since 1997. Fifth. I already sent Nickels a scathing e-mail, which will certainly be ignored. But I don’t place all the blame on our idiot mayor. I place a big chunk of it on the idiots at the Seattle Monorail Project who have continually made stupid decisions like using a car tab fee to pay for the project. We need a non-street-level transit system here. Our streets are choked to death. Is it really so hard to understand this? I am so ready to move to Vancouver BC instead. Someone up there offer us jobs so we can do it. If you want to send Mayor Nickels your opinion, this is where you do it. OK, I went camping on Friday, so I did not post a random ten songs. (Instead, I was drenched by rain and hail and wished very much to be somewhere warm and sunny.) So here, somewhat delayed, is a random ten. Finally, a finished knitting project! 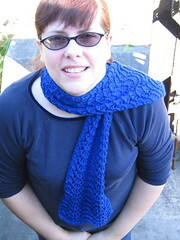 This is a “feather and fan” lace scarf that I started in… May, I think. I got it most of the way done then, then set it aside until this week. It was my first attempt at any kind of lace, and it was very easy. I could have made it longer, but I decided I wanted to be done with it, and it is long enough for me. It is quite warm and soft. When the weather changes I’ll definitely be wearing this one. 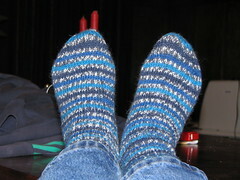 I also finished one sock out of a pair, and you can see a picture of that here. The great thing about socks is that they knit up quickly so you can think “yay, I finished one!” The bad thing is that then you think “aw, I have to knit another one!” Anyway. My feet are always cold in the winter, so maybe I will knit more wool socks. On MetaFilter there’s a tradition of posting “.” to indicate that one has no words. Usually this is used in obituary threads; it’s a way to show that the poster is there, and cares, but just can’t come up with the words to express it. That is me, this week. I’ve visited New Orleans twice (the last time was in August 2001, when we also drove between Pensacola and New Orleans through Mobile, Gulfport, and Biloxi on US 90) and loved it. I wanted to go back again and again. So this has been a difficult week for me, but of course nowhere near as difficult as the week people who live in New Orleans and on the Gulf Coast, or who have family there, are having.